Many may be aware of ice hotels but not necessarily what it is like staying in one of them or how they are made. Every winter, when a river near the hotel property freezes, ice is carved from its depths to build icy rooms. In summers, when the hotel is dismantled (actually, melted away), the water goes back into the rivers. While familiarising with such a concept may naturally draw one to the Nordic countries, there are ice hotels elsewhere too! Just outside of Québec City, the Hôtel de Glace is the first and only ice hotel in North America and perhaps one of the largest in the world! Since 2001, when it opened, it has been functioning every year, for three months: January-March. 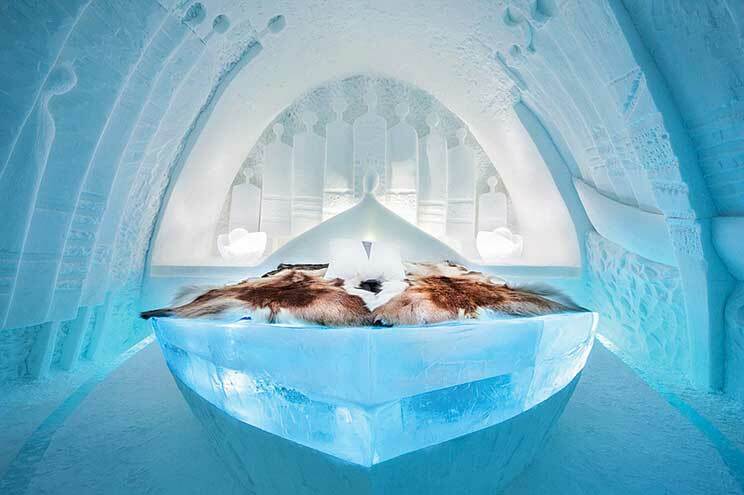 Just like other ice hotels, while all its rooms have the provision of fur blankets and arctic sleeping bags, higher-end suites at Hôtel de Glace have in-room fireplaces! Here, each one of the suites and chambers also has a different theme, with ice beds shaped into circle, star and square platforms. One of the oldest ice hotels, ICEHOTEL in Jukkasjärvi, Sweden has been around (every winter) for about two decades. Its making starts in the most simple and natural of ways, when the River Torne (one of Sweden’s four national rivers) freezes as soon as winter descends. The crystal-clear ice that is formed during winters is apt for the construction. Harvesters cut six-by-threefoot and two tonnes of building blocks of natural ice (preferably the one that grows downwards as it is very clear) for their ‘brand new’ hotel. Every year, the hotel also gets a new theme, artwork and design – making it look an art gallery of sorts. In 2016, ICEHOTEL 365 was launched. This new ice hotel is open all through the year and offers equally exciting experiences. The Snow Village in Kittilä, Finland’s Lapland region has been in news this year for its Game of Thrones-themed ice hotel, which is complete with the iron throne, white walkers and dragons. 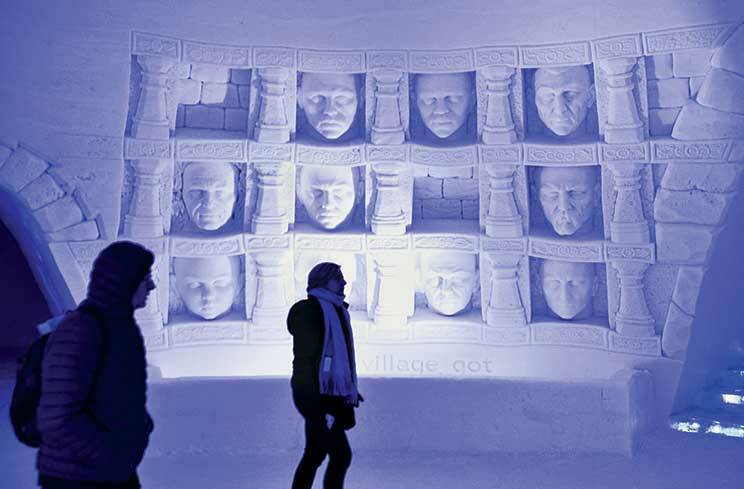 Covering about 20,000 square metre, the Snow Village includes ice hotel, ice restaurant, ice bar and ice chapel. Work on the village begins when the temperature drops to at least minus 10 degree Celsius in late October or early November. 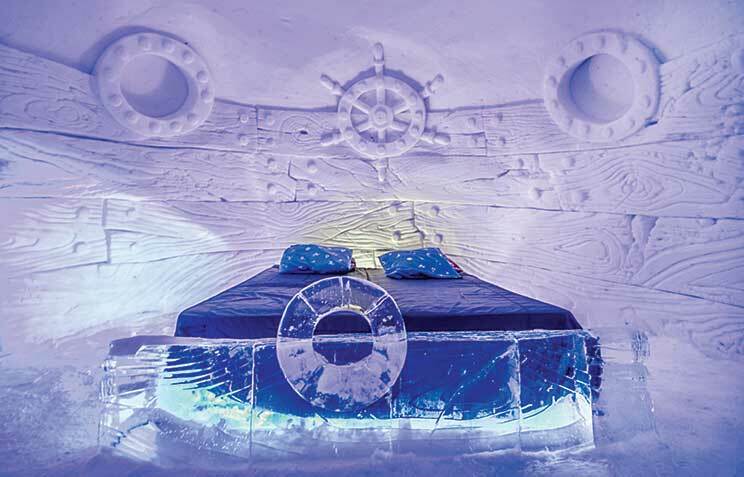 Like other ice hotels, ice art makes for an attraction but it is the mood lighting that adds to the drama of the theme! At the Kemi Snow Hotel in Kemi, a northern Finnish town, the hotel is crafted from the Gulf of Bothnia, the northern-most area of the Baltic Sea. The Kemi Snow Hotel is part of the gigantic Snow Castle built annually in Kemi. The Snow Castle is open from the end of January until beginning of April. 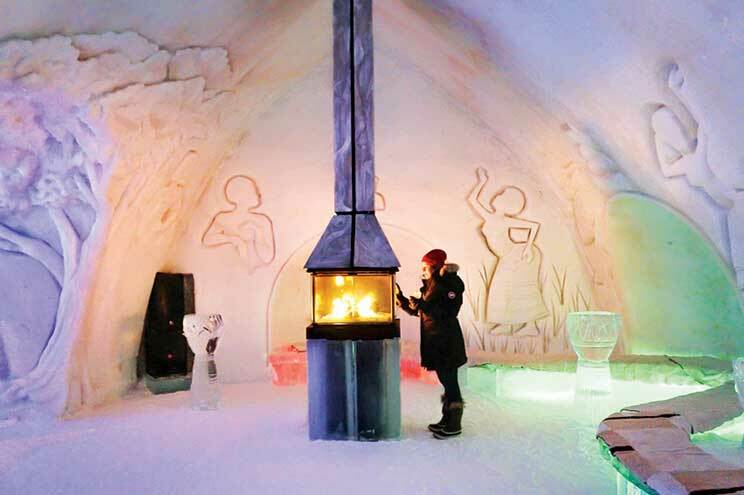 Sorrisniva is among the world’s most famous ice hotels and next in line to the Jukkasjärvi ice hotel in Sweden and just like it, the hotel is rebuild every year. 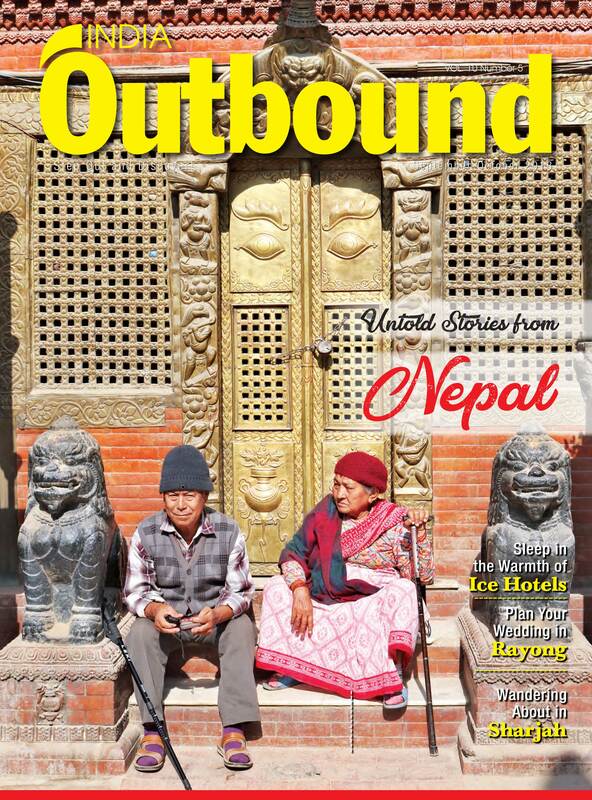 When spring sets in, the entire hotel is reduced to puddles of water, also giving time to the artists, who are all local people, to carve new designs. At Kirkenes, the local texture is not just in the ice. The hotel is known for its service letting its travellers slide in the neighbourhood on a sledge pulled by 108 huskies! One can also go chasing the northern lights on clear evenings, fish for king crab in the Norwegian Sea and bring the catch back to be cooked at the hotel restaurant. On Japan’s northern-most island of Hokkaido, Tomamu is an ice village, which is crafted every winter. It is known for receiving about 14m thick snow, which is powder soft like icing sugar. The village can be accessed by a stair case or even ice-slide, and has an ice bar, ice sweets’ cafe, ice flower gallery, ice maze, skating rink, ice chapel for weddings, a studio for learning to make ice sculptures and of course, an ice hotel. The village is open between December-March, after which it melts. 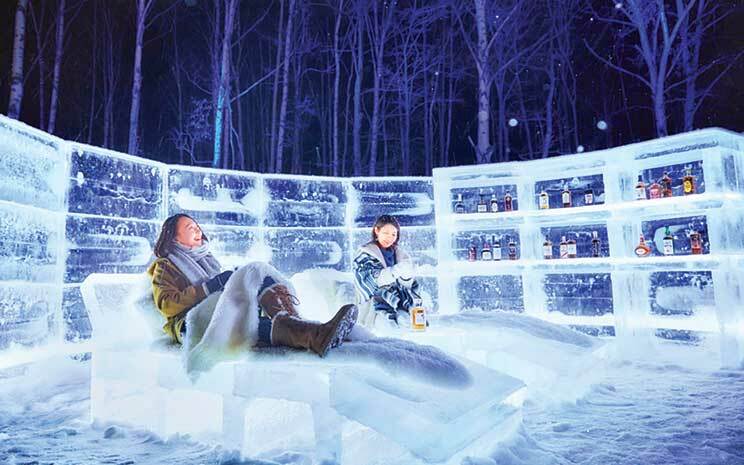 An overnight stay costs about JPY 20,000 (about INR 13,000) per person, which includes access to the outdoor arctic bath and neighbouring ice lounge, where guests can taste 20 different Japanese whiskeys.